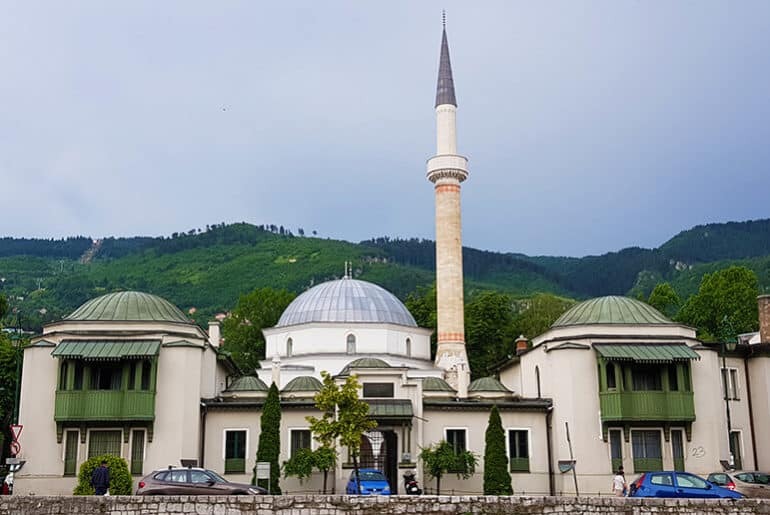 Mostar is a colourful, vibrant city full of 16th Century Ottoman architecture, plenty of traditional restaurants, market stalls, mosques and other historic buildings. 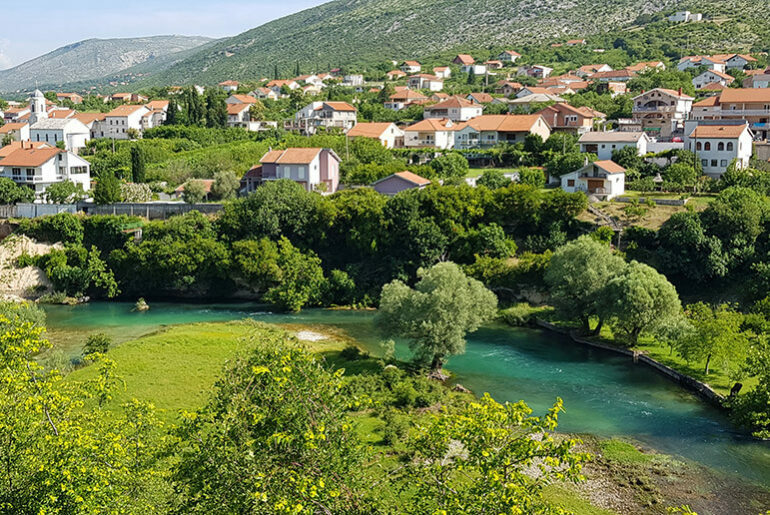 There are so many things to see in Mostar, so make sure you have enough time to really enjoy the city. We had been warned about speeding in Bosnia and trust me, it would pay to heed this advice. Round every corner and on every straight, there were police with radar guns trying to catch those exceeding the speed limit. With the sheer number of policemen we saw, we joked that more than 50% of the population must be police! With this in mind, we carefully drove the 7km from Blagaj to Mostar, where we found a place to park Miles McFlattery, our campervan, above the old town. Looking down over Mostar we could see the minarets and a sea of red roofs. As we got closer to the old town, the streets changed from flagstones to little round cobblestones. Years and years of millions of feet have polished these little pebbles to a high sheen and consequently made them into the slipperiest streets imaginable. I often giggle when reading blogs where they warn you to wear sensible shoes, as we are only ever in slip slops, but these streets had me a slippin and a sliding all over! 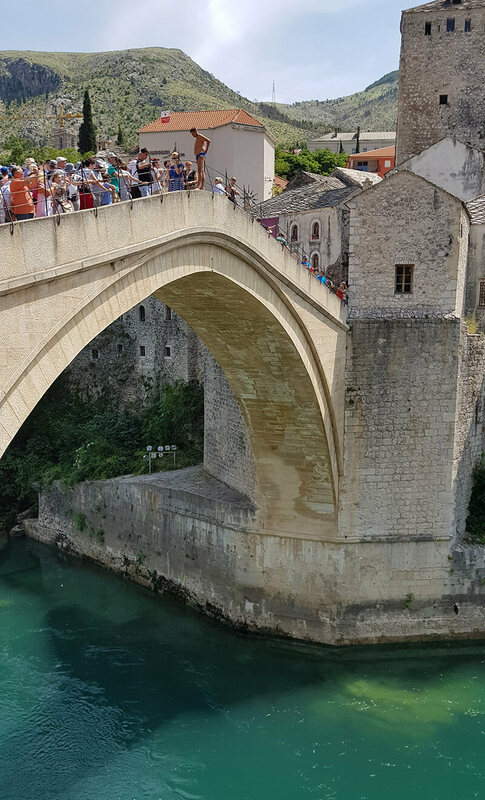 The biggest attraction is the famous Stari Most Arch bridge. Spanning the Neretva river, the old bridge stands in the heart of the city and connects the two parts of the city. The bridge was rebuilt by hand using traditional methods in 2004 after the original bridge was destroyed in the Bosnian War. It was given UNESCO World Heritage status in 2005 and attracts thousands of tourists every year. Despite being a height of 24m, there were a few crazy men jumping off the old bridge into the icy water. I noticed that they spent a long time standing on top of the bridge before jumping, so I asked a local guide what they were waiting for? He said they wait until they have been given a total of €30 by the tourists before they jump! We spent ages watching them freefall from that dizzying height into the icy waters below. The Old Bazaar stretches across both sides of the Stari Most, which divides the Muslim and Croat sides of the city. The quaint cobbled streets are jammed packed with stalls selling all manner of souvenirs, scarves, trinkets and other Eastern-inspired objects. We loved wandering the streets, browsing in the shops with gelato in hand. The stallholders were pleasant and not pushy in the slightest, which we were grateful for. Tai got super excited looking at paraphernalia from the war. Old bullets made into bottle openers, army jackets, gas masks and water bottles. He finally chose an old telescope used to calculate how far to shoot the cannons and he was beyond happy with his purchase. The Koski Mehmed Pasa Mosque can be seen from most places in the city. It is a majestic mosque with a cool and tranquil courtyard looking out over the river. You can climb the stairs up to the minaret for a bird’s eye view of the city. Kriva Cuprija or the Crooked Bridge is a mini version of the Stari Most. It is much older than Stari Most and was originally built to test the design and construction to be used to build the Stari Most. It was washed away in a flood in 2000 but has been renovated with aid from UNESCO. 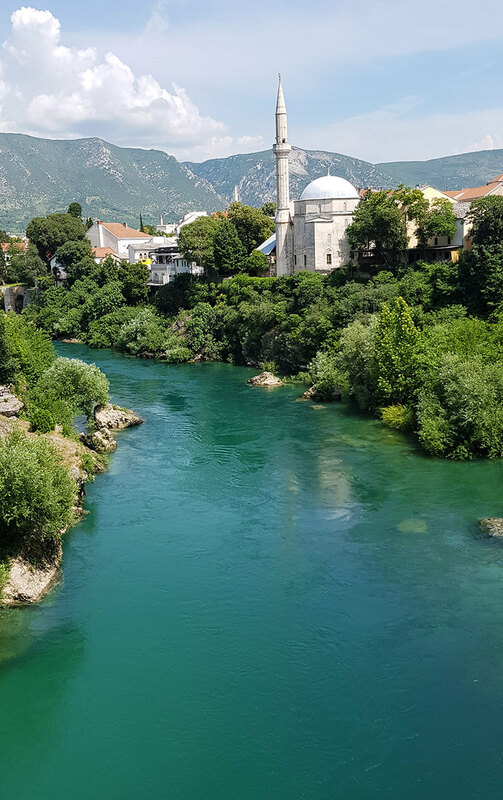 Mostar is full of little cafes and restaurants, from ones hidden away down cobbled lanes to those overlooking the Neretva River, the choice is wide and varied. You can even sit back and smoke a hookah pipe at some of the restaurants. 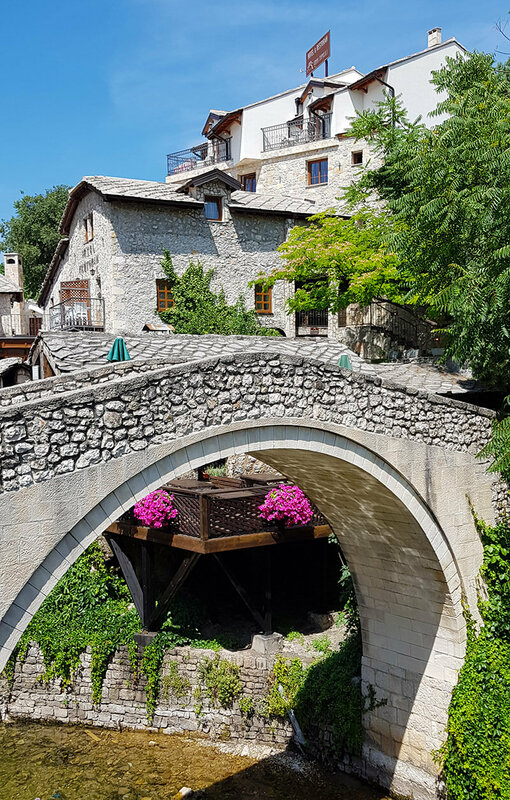 If you’re looking for a fabulous day trip from Mostar, then the little village of Blagaj is the perfect place to visit. Considered one of the most mystical sites in the whole of Bosnia and Herzegovina, here you’ll find the Blagaj Tekija, a 15th Century Sufi house for dervishes. This tekke (dervish house) is the most visited monastery in the country and it is easy to see why with its stunning setting under a looming karst cliff and alongside the aquamarine waters of the Bune River. The cave alongside the dervish house is home to the Vrelo Bune Spring, an incredibly powerful spring arising from an underground karst river and forming the main source of the Bune River. Enjoy a relaxing lunch at one of the riverside restaurants, while the icy water of the river acts as a natural air conditioner to relieve the intensity of the summer heat. All the places to stay in Mostar are relatively close or in the Old Town. 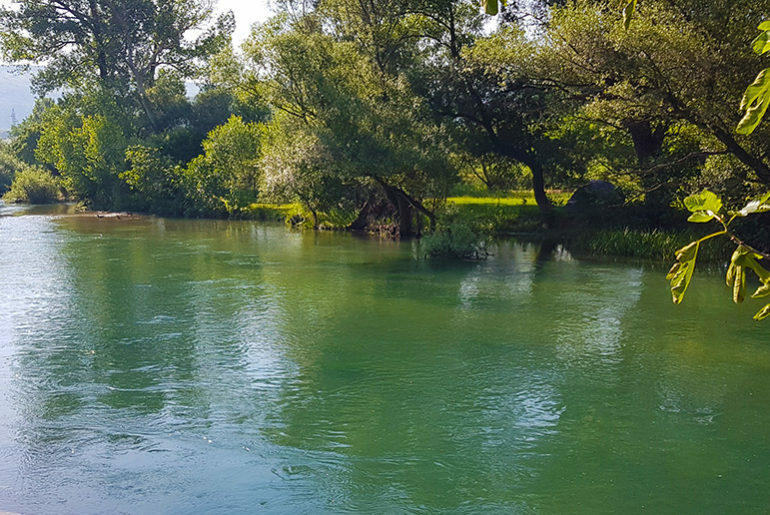 The main difference will be on which side of the river you are on – the Croat or the Muslim side – and whether you have a view of the beautiful Buna River. The Old Town is relatively small and pedestrianised so you’ll easily be able to navigate everywhere on foot. Mostar is a popular day trip destination from Dubrovnik, as is evident by the busloads of tour groups cramming the streets. If you are traveling under your own steam, I would really suggest getting there early or even after the buses have left would be ideal. The old town with its narrow alleyways can also be very hot so early morning or early evening would be the best time to visit. 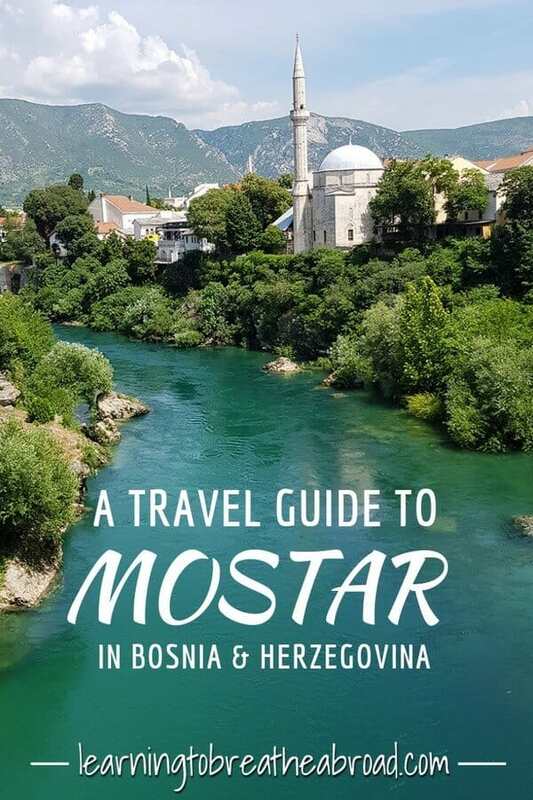 Make sure you have enough time to do all the things to see in Mostar.